Guest post by Hannah Godfrey. Some of you may know me or recognise me as a resident of Tongwynlais, and potentially a few of you might even have seen me running around the area (looking miserable!). I was meant to be running the London Marathon 2017 but I badly injured my ankle and had to defer. Thankfully, I’ve now been given the all clear by my surgeon and physio to run this year. I have to admit that getting my fitness back has been tough, and is still a work in progress! Although there’s no way I’ll be achieving any kind of award winning time, its so important to me to complete it. Myself and a friend, Chris Myhill, are running for a charity called Cardiac Risk in the Young (CRY) and here’s why. When I started a new school in year 7, I only knew a handful of people on my first day, two of which were my brothers! I soon became friends with Georgina and we have been best friends ever since. Through our school years we were inseparable and I began spending a lot of time with her family – her mother Fay, father Paul (who was also my Maths teacher) and brother Matthew, who was a couple of years younger than us. Georgina’s family always made me feel welcome and I have so many memories of Eurovision parties, birthday parties and curry evenings, to name just a few! But being normal penniless teenagers, Georgina, Matthew and I often spent time hanging around the house finding our own fun – usually watching the music channels, playing pranks or practising singing and dancing routines (we were very talented!). In 2007 a tragedy struck the Hughes family. Matthew passed away. He was just 17 and it was sudden. He was not unwell. He had gone to bed as normal the previous evening and by the morning, when Georgina went to wake him, he was gone. What the family went through on that day and since is unimaginable. A detailed post mortem gave no definitive indication of cause of death, but Sudden Adult Death, potentially related to an undiagnosed heart condition was suspected. Sadly, the family had to cope with their loss without any certain knowledge of the circumstances. Georgina and her family have been unbelievably dignified and strong since Matthew’s death, and have received valuable support from Cardiac Risk in the Young, including counselling and family support days. They have not sought to blame, and instead strive to ensure that other families do not go through the unthinkable, as they did. Every week in the UK 12 young people die of undiagnosed heart conditions. One of the ways to try to reduce the rate of Sudden Adult Deaths is to do a cardiac screen on young people involving an electrocardiogram (ECG) and echocardiogram (heart scan). 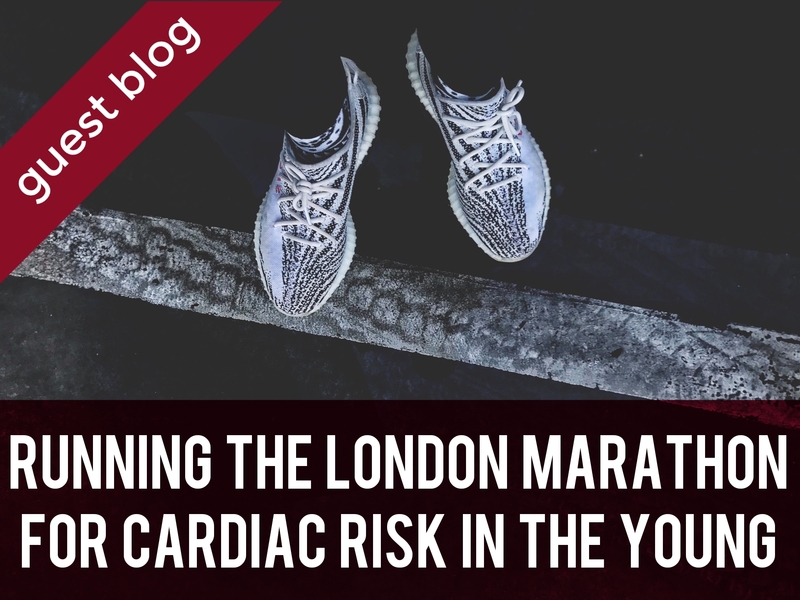 Cardiac Risk in the Young offers this service highly subsidised or free in areas throughout the UK, and of course with our support will be able to extend their services further. More information regarding their services can be found on their website. He just said goodnight mum and went to bed as normal. He never woke up. Myself and Chris have pledged to raise a minimum of £1,900 each for CRY, a substantial figure which we hope will greatly help the charity to continue to provide their valuable services and prevent more Sudden Adult Deaths. 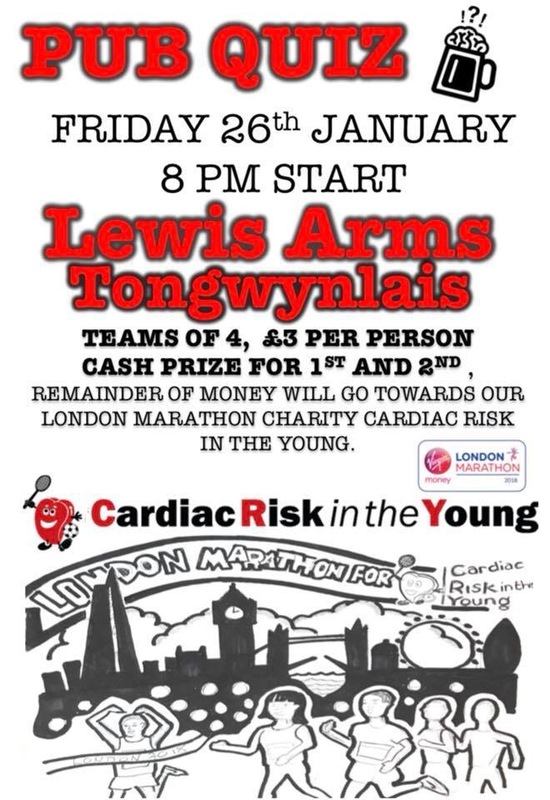 We have organised a charity Pub Quiz at the Lewis Arms, Tongwynlais on 26th January beginning at 8pm. The entry fee will be £3 per person, teams can be up to four people and there will be prizes for the 1st and 2nd placing teams. All are welcome and we hope it will be a very successful evening. Thank you in advance of your support for a charity that means so much to us.